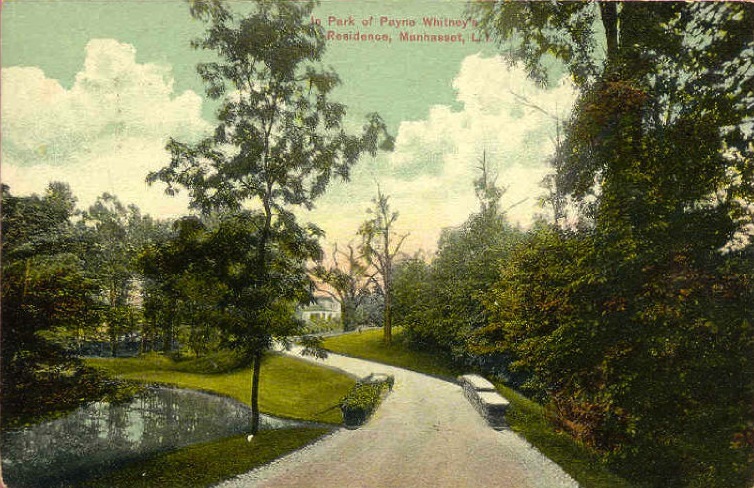 A view on the grounds of 'Greentree', the Payne Whitney estate in Manhasset. Click HERE for more on 'Greentree'. I was fortunate to visit during the 80s. Even though some of the property had been given to the hospital by then, etc., and only Mrs. Whitney was living on the estate (with a staff of 70 or so), it was all still maintained beautifully and always ready for visitors, fresh flowers from the greenhouses, towels stacked on chaises by the pool (indoors and out), the golf course groomed, etc. But most impressive of all was the art! Did you happen to meet the butler Emil when you were there? They don't make 'em like that anymore. I was there in the late 80s and was lucky enough to be served some of Betsey's famous iced tea -- in rather homey, if somewhat declasse monogrammed glasses. The manor house being used for all of about 45 days by the Whitney family back in the day. Sheik Mo has invested a considerable sum into restoring, updating, sadly razing and replacing some structures although the replacements have kept the original architecture. It is adjacent to the Saratoga Race Course (it abuts the former Spencer Trask estate of Yaddo) so horses not stabled at the track can be led directly to the race grounds. I remember that alligator. His name was Oscar. There were was a brilliant Macaw in the greenhouse also, if I remember correctly. It's funny that I stumbled across your wonderful blog this morning. My mother and I were just talking about Oscar the other day and wondering what happened to him.